Scopeshot of transmitter output modulation. 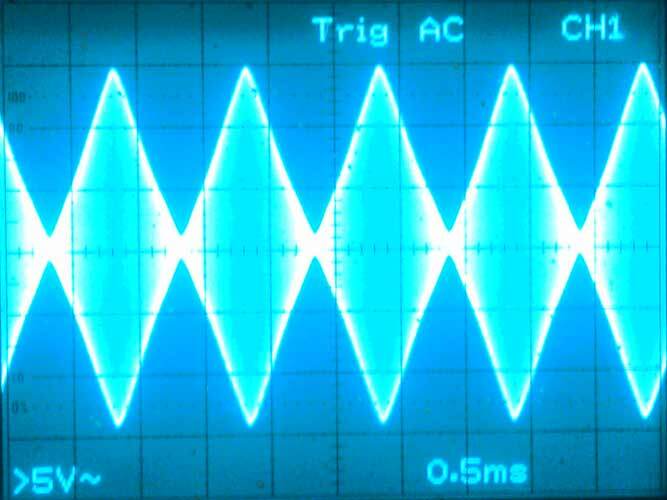 Carrier frequency is 1MHz and modulated signal is 1KHz triangle wave at 100% modulation. Want to broadcast your own music or programming to a nearby radio? Reluctant to modify a nice original antique radio for an audio input jack? 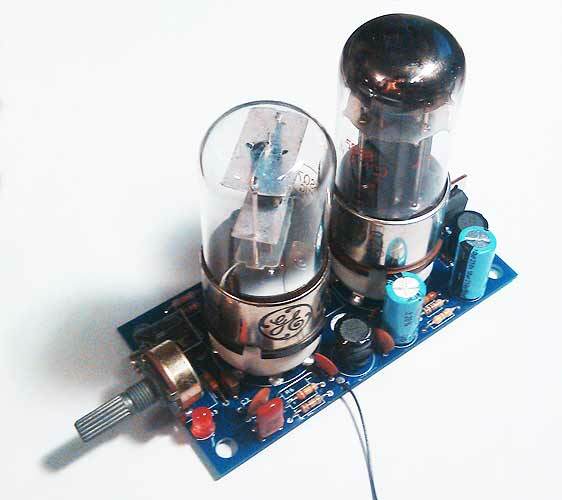 Looking for a fun and practical vacuum tube project? 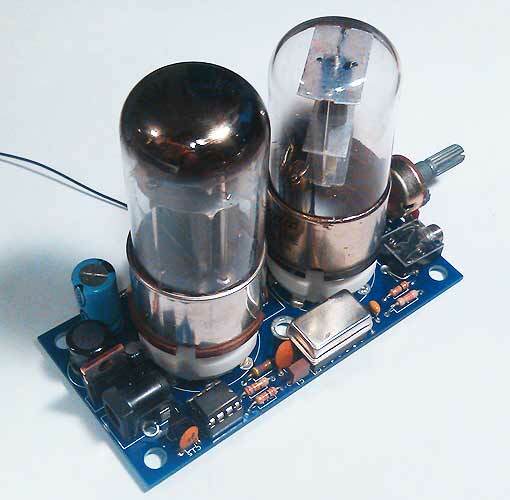 Then this two-tube AM radio transmitter may be the project for you! 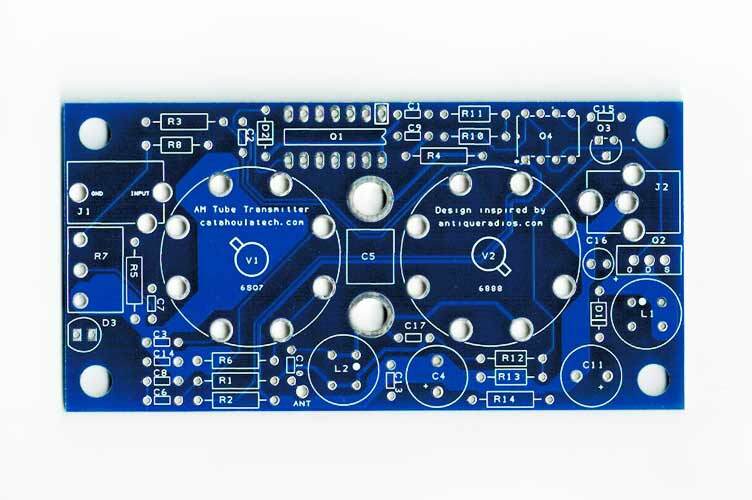 The transmitter design is a hybrid combining a couple old-school tubes for the audio and AM modulation with modern solid-state support circuitry including the oscillator and power supply. The tube aspect of the design was developed by members of the Antique Radios Forum. Overall the board only requires 6VDC input from a wall adapter to power the tube filaments and switching power supply. The switching power supply utilizes a simple boost converter topology using a 555 timer driving a power MOSFET and an inductor to generate about 150VDC at 20mA for the tubes. The 6SQ7 is used as a high gain audio preamplifier and the 6888 is used as an AM modulator capable of 100% modulation with low distortion. The carrier frequency is supplied by a standard 5V 1MHz or 1.2MHz oscillator. The transmitter range is capable of broadcasting to most radios within a home. More documentation on this design can be found under Version 2 of the Two-Tube AM Transmitter at www.electronixandmore.com. CAUTION: The board generates voltages that are significantly higher than what it takes in. It is your responsibility to ensure your safety when using the transmitter. 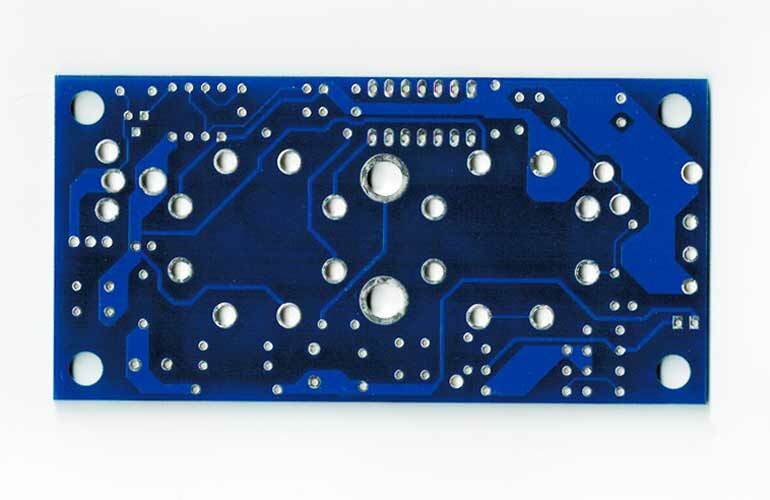 Board dimensions (approx): 2" x 4"
Included is a single unpopulated PCB. All the other required components to complete the assembly are not included such as the tubes, sockets, wall adapter, and other discretes. The photos above of the assembled board are for your reference only.